Carefully worded so as to avoid grievances, this letter terminating an employee for theft focuses on the way the employee violated company policy. 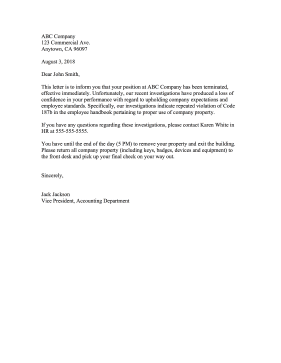 This letter is to inform you that your position at ABC Company has been terminated, effective immediately. Unfortunately, our recent investigations have produced a loss of confidence in your performance with regard to upholding company expectations and employee standards. Specifically, our investigations indicate repeated violation of Code 187b in the employee handbook pertaining to proper use of company property. If you have any questions regarding these investigations, please contact Karen White in HR at 555-555-5555. You have until the end of the day (5 PM) to remove your property and exit the building. Please return all company property (including keys, badges, devices and equipment) to the front desk and pick up your final check on your way out.